October 22nd is just a day. Since 1996 it has been set aside for the explicit purpose of creating awareness and response for those who are victims of police brutality. For those whose lives have been ended, or forever changed at the hands of police. As a day of national organizing it has grown and shrunk in terms of popularity. Currently, marches, demonstrations and vigils are held every year, but mainly in large coastal cities, with a few smaller towns and cities throughout the country. In the beginning, 50-100 cities would mark this day with an event or demonstration of some kind. In this past year a clear stance has been articulated by people in this city- we will no longer be victims. The brutal nature of the police is a fact that we do live, but we will no longer live under it. We have seen an upsurgence in activity regarding the police and what effects living in a policed world can have. Starting late last summer a weekly demonstration in front of the city jail had been initiated by friends and family members of Scott Perry, a man murdered in the downtown jail through medical neglect by the staff there. At these demos, information about others who had lost their lives in that and other St Louis correctional facilities were passed out to hundreds of people. Summer passed into fall, and the Occupy phenomenon began to take shape. Inside of this cacophony of movements an element of solidarity was reinvigorated and generalized. Encampments across the country began to respond when the police, often brutally, evicted other sites throughout the country. Here in St. Louis, one of the most successful responses to such evictions was on November 17th when people briefly took over of the abandoned downtown municipal court house. In January of this year, we saw yet again, what police departments on the west coast are capable of as huge mass arrests and a myriad amount of chemical weapons and brute force were used against those taking the streets on J28, or “move in day”. Locally, solidarity took the shape of not one, but two marches, the largest being down South Grand. A large number of rowdy participants took the street, wheat pasted propaganda, literally wrote their displeasure on city buses and attacked the police sub station with paint. At times, the responses are anonymous. Graffiti followed the brutal beatings of three comrades at the hands of the police last March. The park on the south side where the event took place was covered in anti-police messages. In December of last year, a man was shot to death by the police on the north side. The restaurant that he was killed outside of became the canvas for anti-police slogans and messages of vengeance for dead friends. 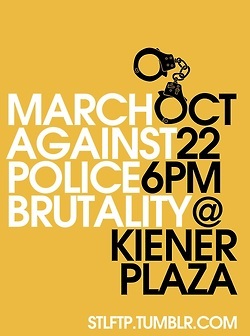 This October 22nd, we are calling for a march, not one only against the physical brutality that the police can inflict but also against the more insidious nature of their control. The police are but one arm of the state and it’s attempts to maintain us as ‘productive’ and ‘civil’ members of the society they have created. Here in St Louis we have seen the war being raged against communities of color and youth throughout the city. The racist policies employed in downtown curfews and nuisance abatement units on The Loop are just the beginning. The police in this city have shot and killed nearly 10 black men in the last year, many under a barrage of dozens of bullets. This is a day, where we say that every one of those bullets will be answered!